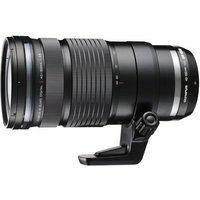 Dust, splash and freeze-proof, the Olympus 40-150mm lens with Micro Four Thirds fit features a maximum f2.8 aperture and delivers outstanding performance throughout the zoom range, even in low light. The lens incorporates a new focusing system which powers two high-grade elements using dual linear motors for ultra-quick and near-silent focusing. The lens offers a 70cm minimum focusing distance at all focal lengths.